Well, once again I am writing you all on a Tuesday! With Columbus Day yesterday, the libraries were closed so emailing was unavailable. But thankfully I get some time today to write out some emails! So much has happened this past week, so I guess I’ll just jump right in and tell you about it. Last Monday was a tiring but good preparation day! After bowling like usual, we went to wash our car at the do-it-yourself place. (Missionaries have to wash their car once a week… fun fact of the day) The elders were washing their car in the stall next to us, and right as they were finishing, Elder Holland stuck his sprayer over the cement wall divider and sprayed us! It was hilarious and totally unexpected. Thankfully we weren’t in our proselyting clothes, haha. 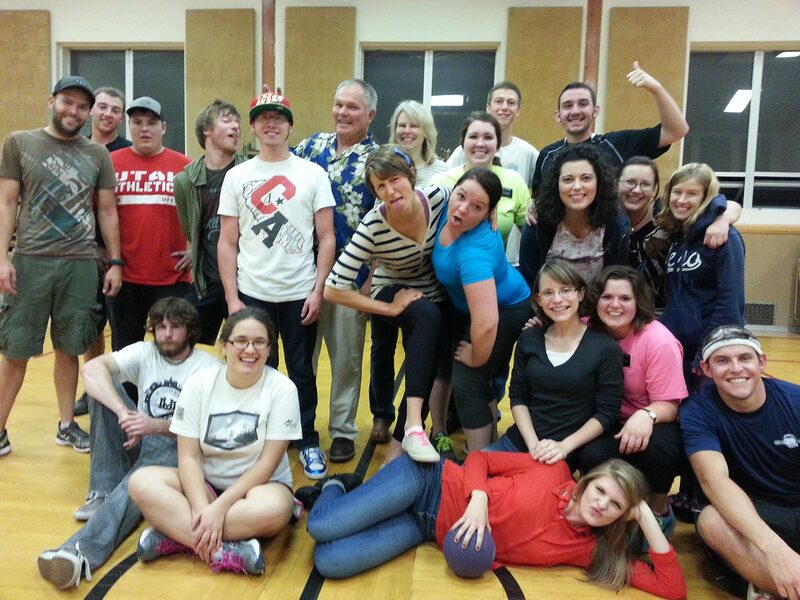 We played pod-ball and basketball with the missionaries for a long time, and then we played dodge-ball again with the YSA kids for FHE that night. We introduced pod-ball to them, and they all loved it. Our investigator Karen came to FHE as well, which was great. 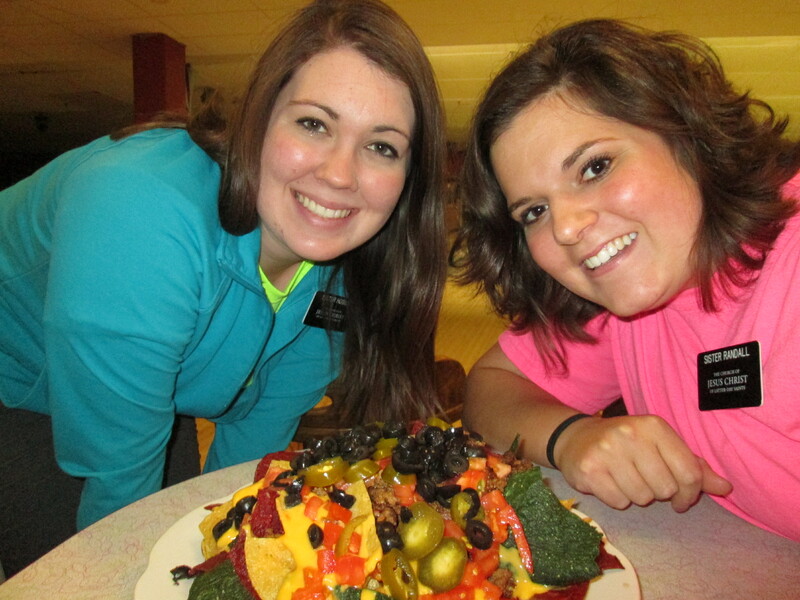 Our enormous nachos from the bowling alley! On Tuesday I received a little tender mercy from the Lord. The girl from our ward who also lives with our host family told me of an experience from the day before, being Monday. 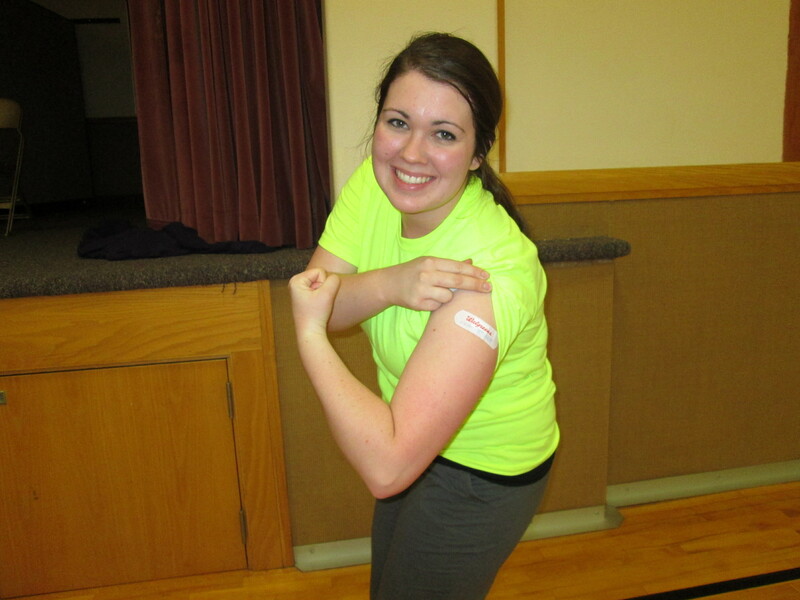 She was at FHE, and since she is recovering from shoulder surgery, she was sitting on the stage watching the dodge-ball game with a few others. She was feeling really lonely and left out and wanted to leave. She told me that she offered a prayer and asked Heavenly Father to help her and send her someone. Right after she said “Amen”, she told me that I came walking up to her and talked to her and sat by her, and it meant so much to her. From my end, I definitely had received the prompting that I needed to quit playing and go talk to the people on the stage. It’s easy at times to feel like our efforts go unnoticed and don’t make any difference, and I had been struggling with this. But this little tender mercy reaffirmed to me that the little things do matter, and you never know who needs a hug or a smile. As President Monson says, “The world is in need of your help. There are feet to steady, hands to grasp, minds to encourage, hearts to inspire, and souls to save.” The Lord’s work is incredible! The second half of the week was spent doing lots of preparations for our table on campus on Friday. We got some big pieces of bulletin board wood stuff for super cheap from an up-cycling place here in town (the guy cut us a deal for $3 for both boards! ), and then we painted them and then we stapled balloons all over them. 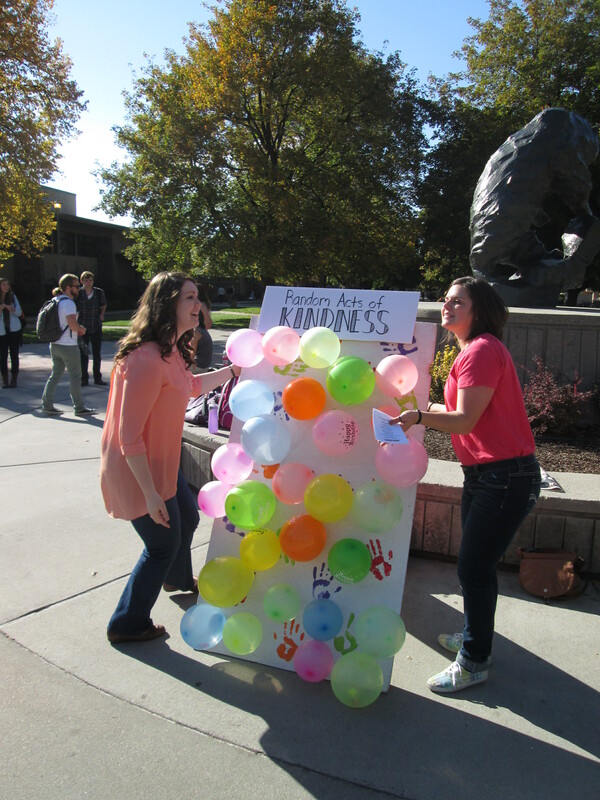 The idea was that the students throw a dart at the balloon and inside the balloon was a “Random Act of Kindness” that they are supposed to perform that week. The event on Friday was an awesome success! 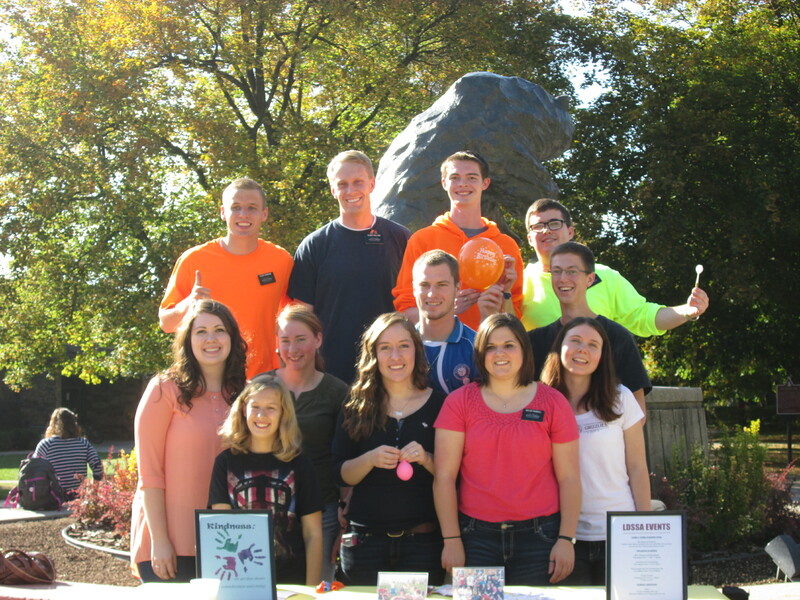 We had a bunch of our ward members there with us helping out, and we got to talk to a bunch of students. Sister Randall and I actually had to leave the booth halfway through because we had to go buy more balloons! This Friday we are having a booth in the student union about Family History- should be fun. More of my favorite people! Here’s another example from this week of the little things making a difference. The members we live with have a friend who is a single mom and struggles with some addictions, and the friend sometimes comes and stays with them so that she’s in a “safe zone”. 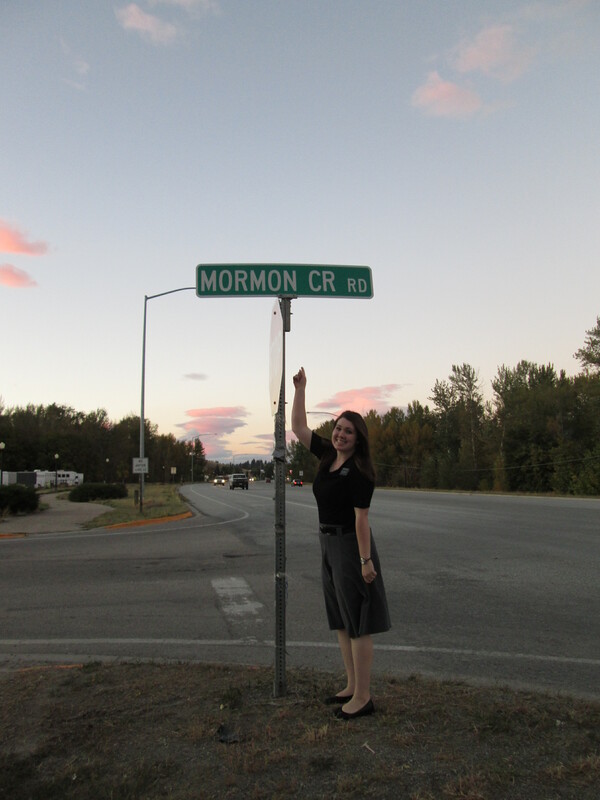 She has a Book of Mormon and has watched parts of General Conference. We’ve met her a couple of times before, but this past weekend it was just us and her in the house because the host family was out of town. We ended up hold her keys and wallet for her all weekend so she wouldn’t be tempted to make any bad decisions. We talked with her for like an hour and a half on Saturday night (yep, wayyy past our bedtime). Just this morning, she was texting her friends and asked for the sister missionaries’ phone number in her town, because she wants to meet with them after spending the weekend with us and getting to know what it is that we do and believe. It was a really big testimony builder again for me that being a good example matters, and you never know who it is that you’re going to affect. Love you all and miss you bunches! Have a safe and happy week!